CuddleFish Friends takes kids under the sea to hear the tale of a polka-dotted cuttlefish named Cecil and his friends. As they participate in Cecil’s adventures, they also learn about life under the sea, discovering sea anemones and tunicates and exploring the coral reef. It’s not all about learning though. 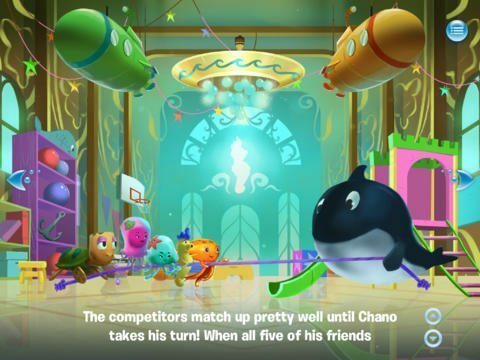 Cecil and his friends love to have fun and kids can join them as they play an underwater organ or enjoy a game of tug of war. While the story is clearly geared towards preschoolers and those in early elementary school, its use of scientific terms and explanations of life under the sea make it a cute story for children in second, third and even fourth grade to read as well. From the bubbles that pop and move through the water as the text is read to the cute animated animal graphics, CuddleFish Friends is a high-quality animated storybook. The developers clearly paid attention to the details as they created the app. Even the arrows directing kids to turn the page are constructed of bubbles and every page has its own uniquely composed soundtrack to add to the ambiance of the under-the-sea setting. One highlight of the story is that it does not shy away from using big words. Even the main character, a cuttlefish, is a type of sea creature many kids have probably never heard of. As they read, they are introduced to even more objects under the sea, including sea anemone and tunicates. When kids encounter sea creatures they are unfamiliar with, it provides a great opportunity for parents to encourage further research, helping their kids look up the creatures in an encyclopedia or online. The one negative to CuddleFish Friends is the text highlighting. As they are read, words bubble up a little, but it may be difficult for beginning readers to distinguish these specific words from the words on the page. Even with the big words and scientific content, this storybook is all about fun. Kids will enjoy making Cecil and his friends spin, zoom through the ocean waters and play games with one another. Younger kids may find themselves bopping along to the background music or turning pages just to hear the sound of bubbles. CuddleFish Friends isn’t your standard interactive storybook. Its high quality animation and music, along with the scientific terms and games it contains, make it worth a slightly higher price tag. As kids read through the story, the text bubbles up to show them which words are being read. Once the text has been read, if kids do not start tapping and swiping around the page, a small hand icon appears and shows kids how to interact with the characters and objects on the page. At times, this helps point out unique games and features that kids might otherwise miss.